Anyone else find the image below a wee bit iffy? It's supposedly of "Gerry Adams", the Bwitish double agent and former "IRA" gunman. Gerry is also President of Sinn Fein, the phony "Irish Republican" Party. The image arrived in my email box. Sinn Fein thought we would like it We do, Gerry, Marty! But for all the wrong reasons. Why is no one wearing sunglasses except for the King of Long Kesh himself? Is it so sunny in Dublin, Fair City, at this time of year? Why is the image so heavily compressed, and then compressed some more? It's just as if there was something to hide in it. P.S. The British promote ETA, says Executive Intelligence Review. By their friends we shall know them, Mr Adams..
Last edited by reichstag fireman on Fri Dec 07, 2012 7:43 pm, edited 2 times in total. The British promote practically every perfidious thing in this world so their meddling in Spanish affairs shouldn't be a surprise to us . None but the Green Flag? Here's another crude dollop of foto fakery from Sinn Fein, the Crown's phony bunch of "republicans" who pollute our island of Ireland. 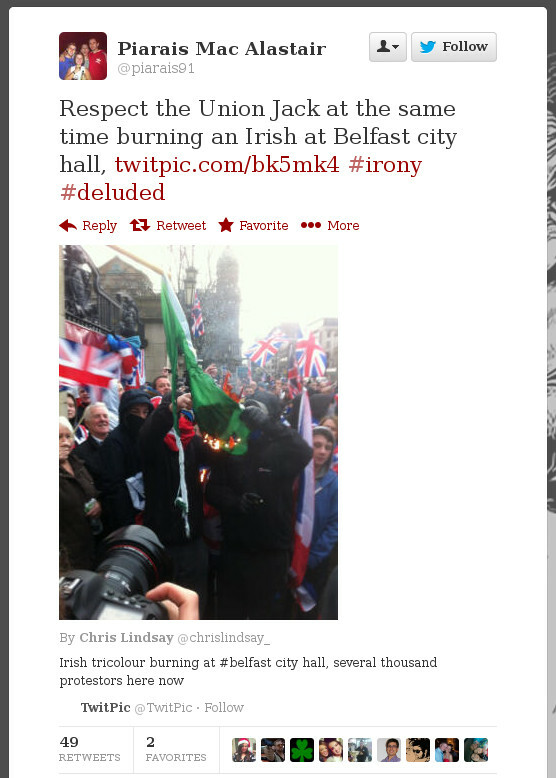 Marvel at the unbelievably pathetic photoshoppery of the "Union Jack" to the left. This reminds of an earlier gaffe by Sinn Fein. A blunder than reveals their completely bogus "republican" credentials. It was 24th April 1993. I was in Galway, a beautiful Irish city almost as far west from Britain as you can possibly get (without crossing to America, God Bless Her). We were in a hostelry off Eyre Square in Galway. The TV was on. Suddenly there was a hushed tone to the room. We looked up to see the TV anchor solemnly announce that a massive bomb had just exploded in Bishopsgate in the City of London. "Unconfirmed reports of one dead and 40 injured". Naturally, the "I.R.A." was immediately blamed. Of course we realised soon enough, from the TV propaganda alone, that the bombing was the handiwork of the British Crown (aka the Windsors, aka The Firm). Outside on the streets of Galway, Sinn Fein, the "republican" stooges of the British Crown, had already set to work: bill-boarding the city walls; fomenting hatred across these two islands by sticking up their phony propaganda posters: "BRITS OUT!" The funny thing is that Sinn Fein, by defacing our city walls, blew their cover straight away. Aside every Sinn Fein poster, the idiots stuck up a virtually identical Socialist Workers Party poster, too! Same typeface, same poster size, same printing company. Fancy that! The SWP is a notoriously phony "communist" party run from London by Her Majesty's security apparatus as a honeytrap for tracking genuine communists. Both political parties - Sinn Fein and the SWP - are completely compromised instruments of the British Crown. Bill-boarding the two parties side-by-side belies the hand running Sinn Fein, the hand running the SWP, and the hand behind the Bishopsgate Bombing. It is the hand of none other than the vile Firm of Windsors, itself.